You are here: Home - Uncategorized - NEW ! How about a signing mount. June 6, 2015	Comments Off on NEW ! How about a signing mount. 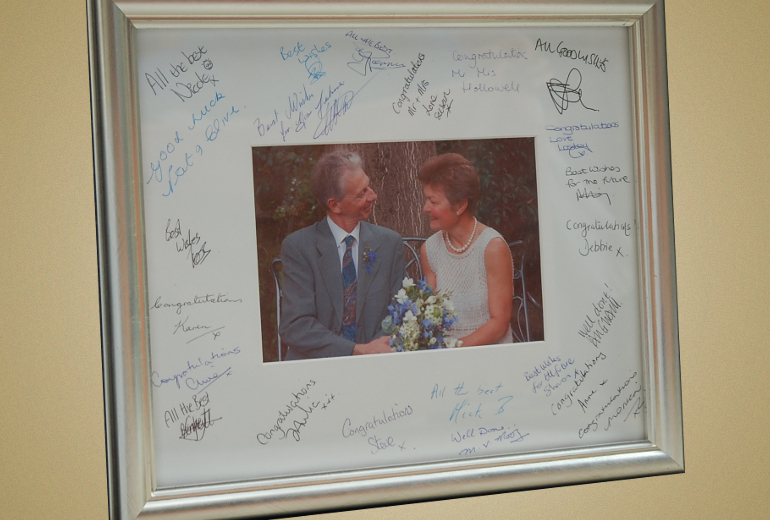 Ask your guests to sign a mount around a photo of whatever the occasion is….21st, engagement, new baby, new home, retirement etc. I could cut the mount in any colour. How about black wit the signing in silver and gold gel pens or white with neon coloured pens. Children’s names in different coloured felt pens could look gold around a party photo. Place the photo in the mount and replace the back securely in with the flexible framing points. EASY! All sizes and colour combinations possible. I have a large selection of mouldings for the frame to suit all decor. The example below is a wedding photo and this would cost about £40.